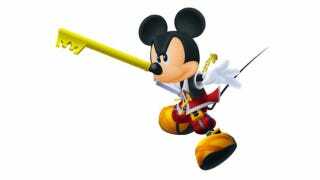 With those Kingdom Hearts games and with new Mickey Mouse cartoons, you'd think being the official Japanese language voice of Mickey Mouse would be a full-time job. For one university professor, it's not. As Peachy recently pointed out, his official gig as the Japanese language voice of Mickey Mouse is only a part-time gig. But just because it's part time, that doesn't mean Aoyagi is barely busy. He's voiced "King Mickey" in the Kingdom Hearts games and voices the character for the Japanese language Mickey Mouse cartoons that air daily on the Disney Channel in Japan—as well as all the other incidental Mickey Mouse voice work required for Tokyo Disneyland and Tokyo Disney Sea, etc. Wonder if he ever recites classical poetry in Mickey Mouse's voice. I certainly hope so.